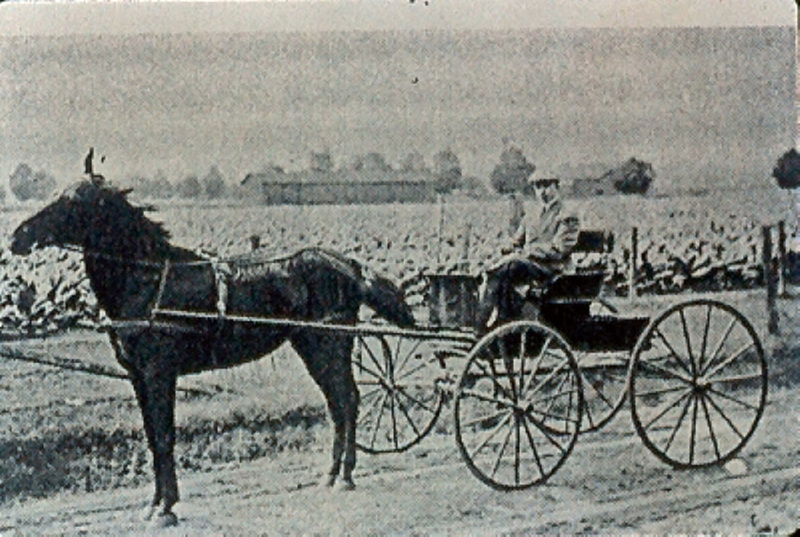 Sanford Elmore raised the first tobacco to sell in 1850 and Charles Theurer and Ben Hill raised the last two fields in 1951. 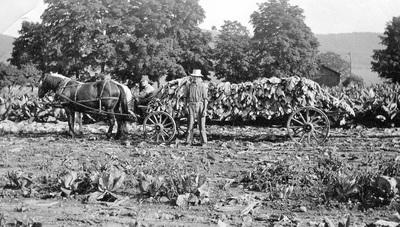 Most of the tobacco grown in Big Flats was used in making cigars, although some of it went into chewing tobacco, snuff, and smoking tobacco. 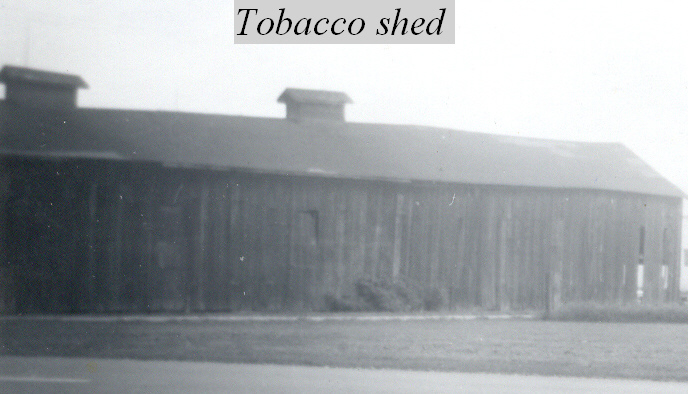 Probably the first tobacco shed in Big Flats was a meeting house built on the corner of Kahler and Lowe Roads in 1828. It was used as a Baptist Church meeting house until 1851; then it was abandoned. Shortly after that it was used as a tobacco shed. 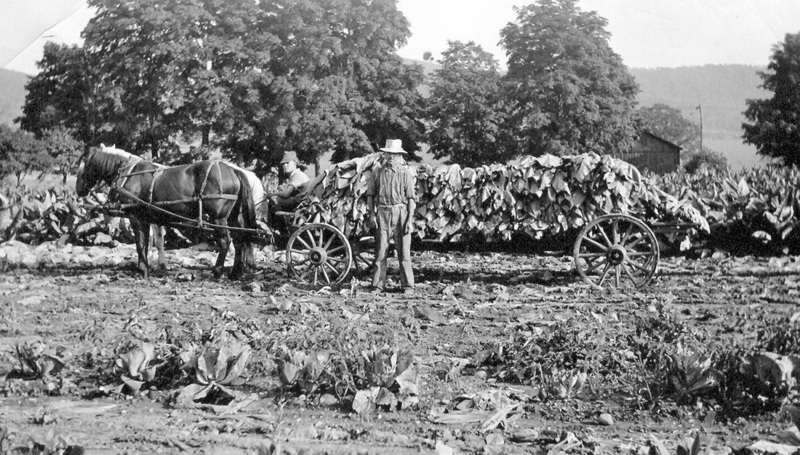 On the eve of the Civil War, Big Flats harvested almost a quarter of a million pounds of tobacco. 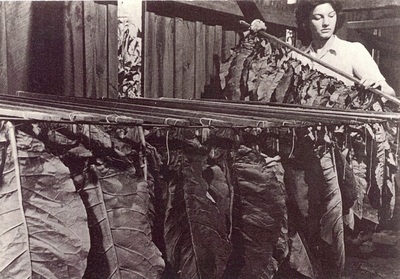 In the early 1870′s, John Brand, who bought tobacco, began establishing packing and processing houses where they could sort and grade the tobacco, then pack it in separate cases 3′ x 3′ x 3′ so the cigar manufacturers could buy just the right type of leaf they wanted. More and more tobacco was being raised and as the year 1900 approached, the golden era of leaf tobacco began. 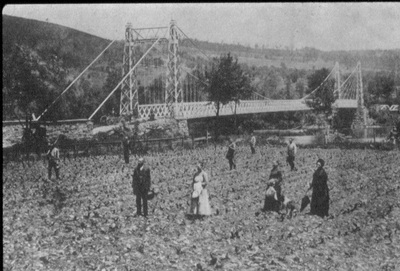 By then about 2,000 acres in Chemung County were under cultivation in tobacco and fields of 40 or 50 acres were not uncommon. 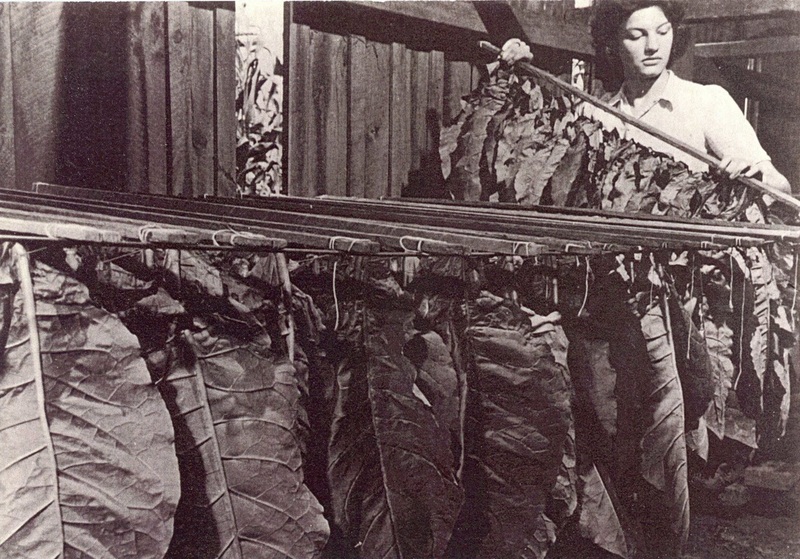 As the tobacco acreage increased, the need for more packing and processing plants also increased. 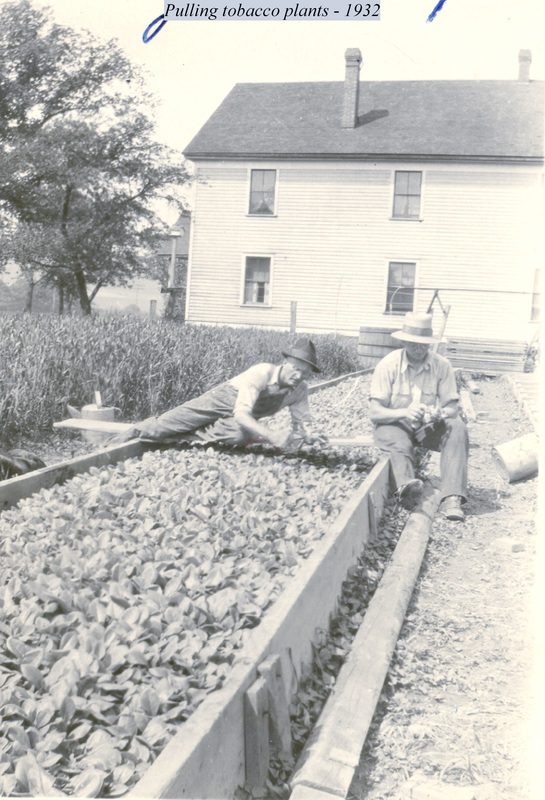 By 1900 there were ten plants in Elmira and at one time there were four plants in Big Flats. The American Cigar Co. built a plant in 1906 where the Agway Fertilizer plant is today. 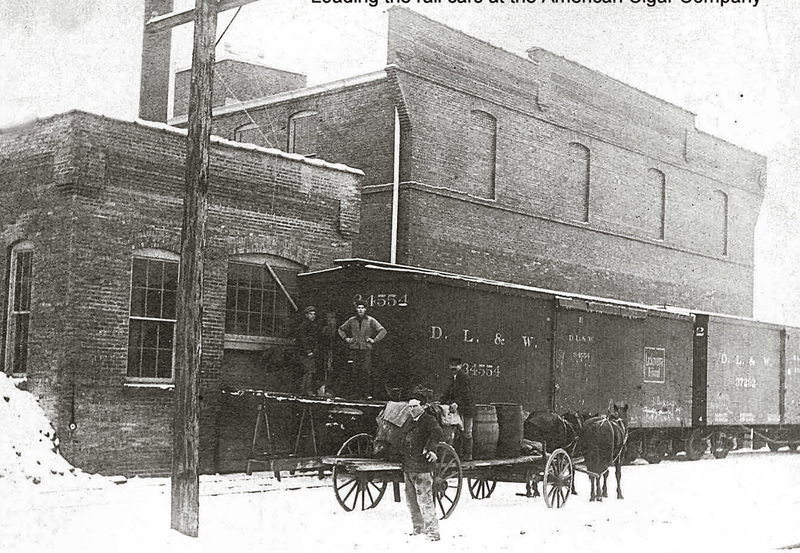 Lowe and Welles had a plant across from Black’s Feed Mill on Hammond St. Later they built on Main St. The building is now known as the Big Flats Business Center. Wallace Markle and his father, Frank, had a plant at the end of Miller St., on the south side of the Erie Railroad. 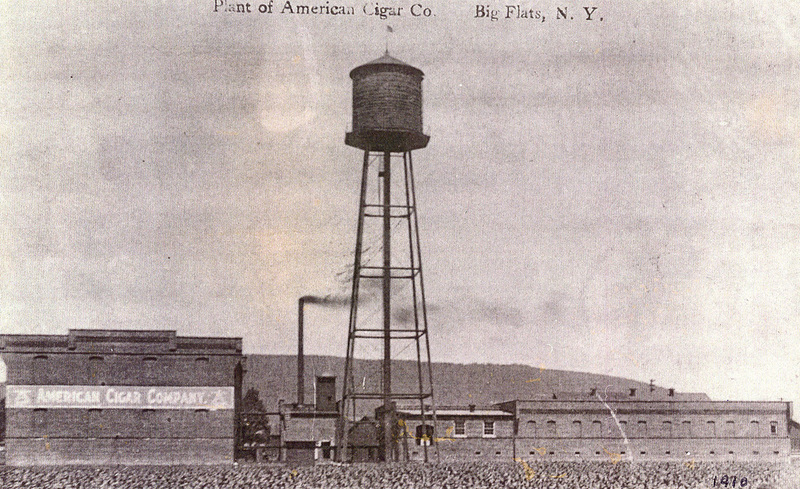 Later Joseph Hardiman, who managed the American Cigar Co. for sometime, built a plant between the railroads just a short distance east of Canal St. 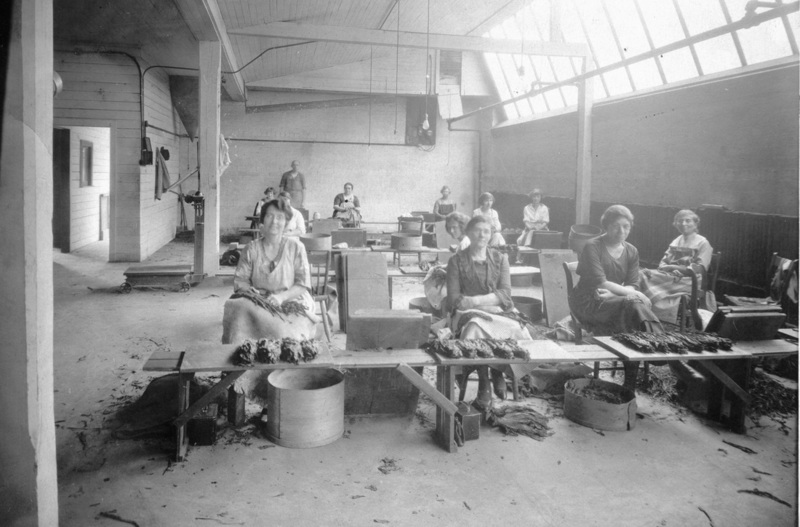 These processing plants had three rooms. The first room was where the workers sorted and graded the tobacco. 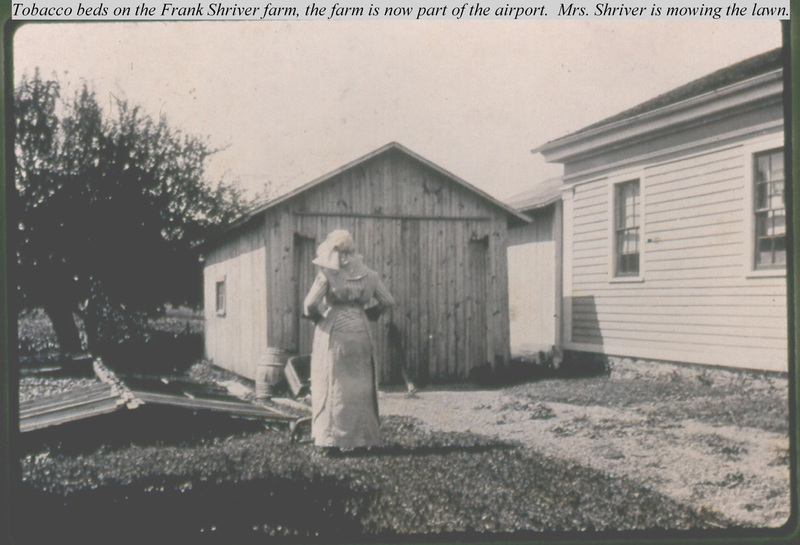 Usually there were skylights for windows that faced the north side so there would be no shadows to interfere with the grading. There were large tables here on which the tobacco was placed. 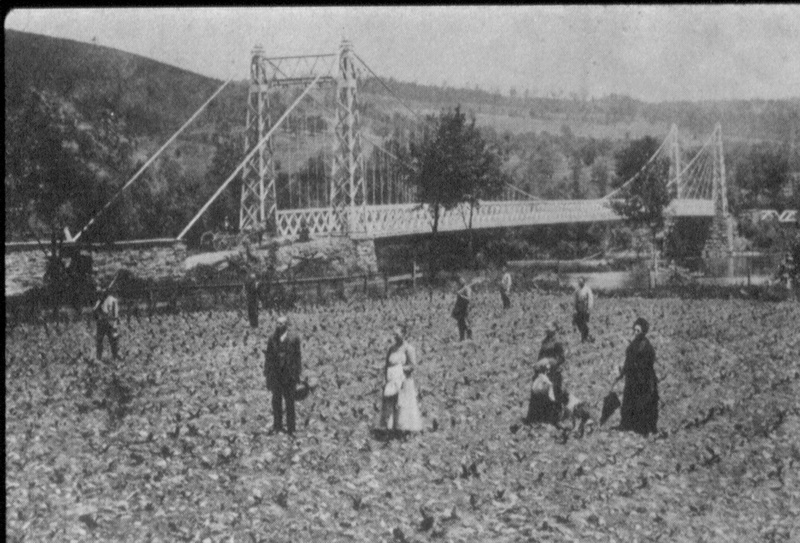 There were partitions on the table in which to place different sizes and grades; then it was tied in handfuls by using a leaf to go around the small bundle and the leaf was tucked in to hold it. This work was usually done by women. They placed the hands of tobacco in the cases which were then put in the sweat room. The second room (sweat room) was kept at about 80 degrees and at a high humidity. The cases were kept in here for ten days or two weeks as it was thought this made the tobacco milder. After the cases were removed from the sweat room, they were opened and checked for dampness. If the leaves were too damp, they were removed from the cases and placed in a dry case in a dry room. 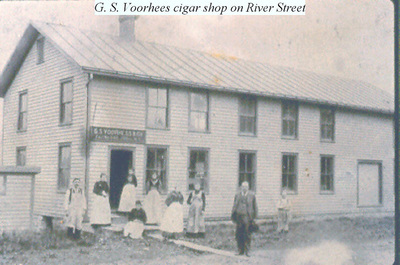 The third room was used to store the cases until the tobacco was sold. 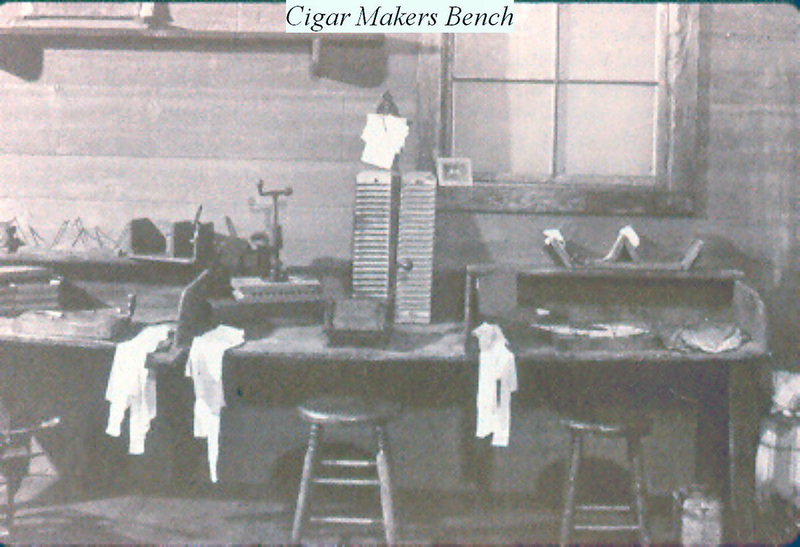 In the 1920′s, the American Cigar Co. sold their plant to Lowe and Welles and they in turn sold their building on Main St. to Hungerford. After World War I, there was a decline in the acreage of cigar tobacco in the county because of the increased use of cigarettes and decline of cigars. 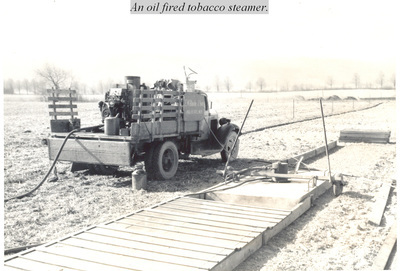 This led to unemployment during the winter months because most of the tobacco growers worked in the warehouses during the winter and in their fields in the summer. 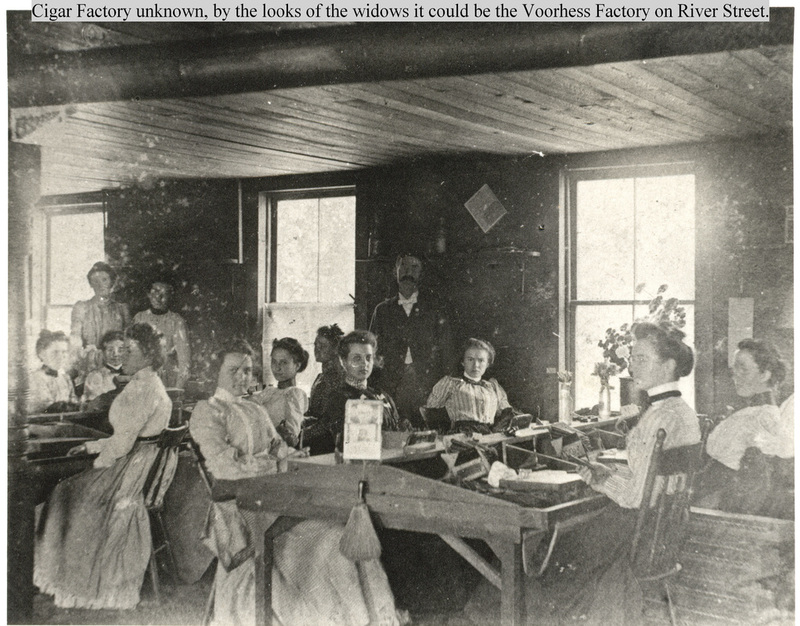 There were more than 200 growers in the county and probably over 1,000 people engaged full or part-time in the manufacturing of cigars. 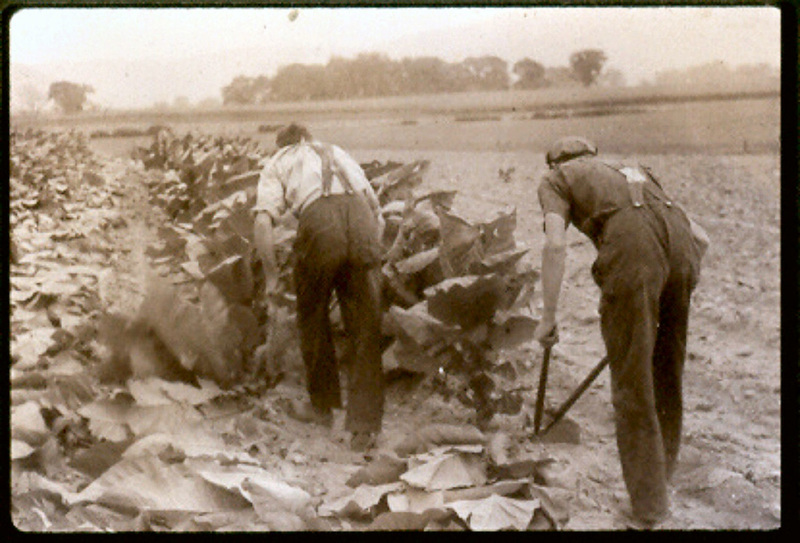 This does not include those who worked in the growing and harvesting of the tobacco. John Welch and George Voorhees had a cigar factory on the east side of River St., just outside the village. This building burned down and then John Welch began making cigars in a building on the south side of Main St., east of the Masonic Hall. 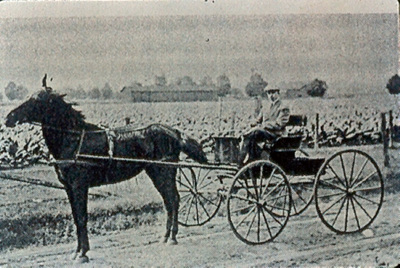 Oliver Johnson had built this building to make wagons and sleighs. John Welch was recognized as an expert on tobacco and the making of cigars. 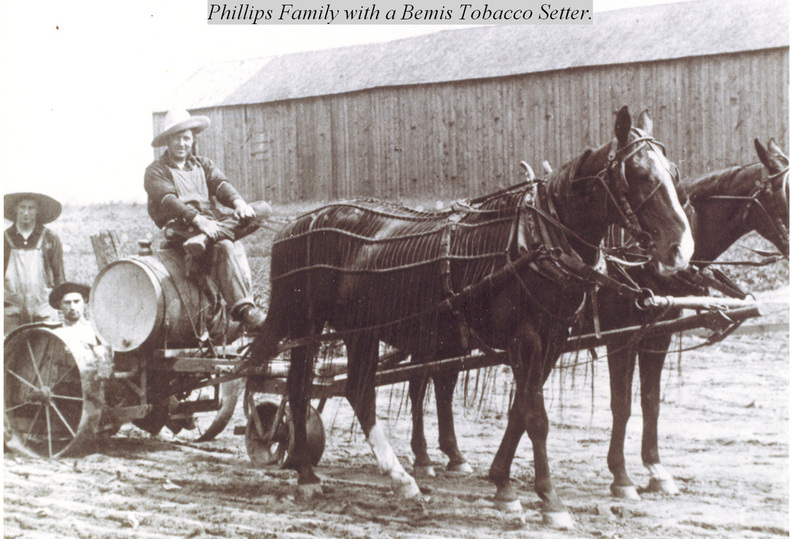 His business in Big Flats put out about 450,000 cigars a year and he employed 16 people. 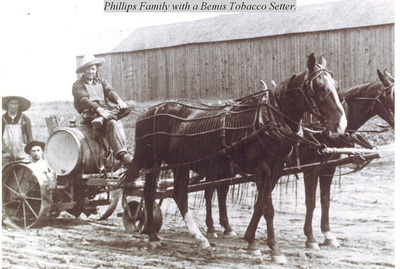 Today most cigars are made automatically; the filler is made of ground up tobacco, as in a cigarette. 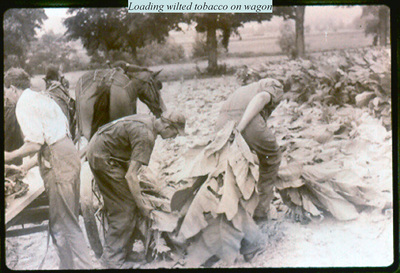 Tobacco pulp is made into paper like sheets and used for the wrapper. 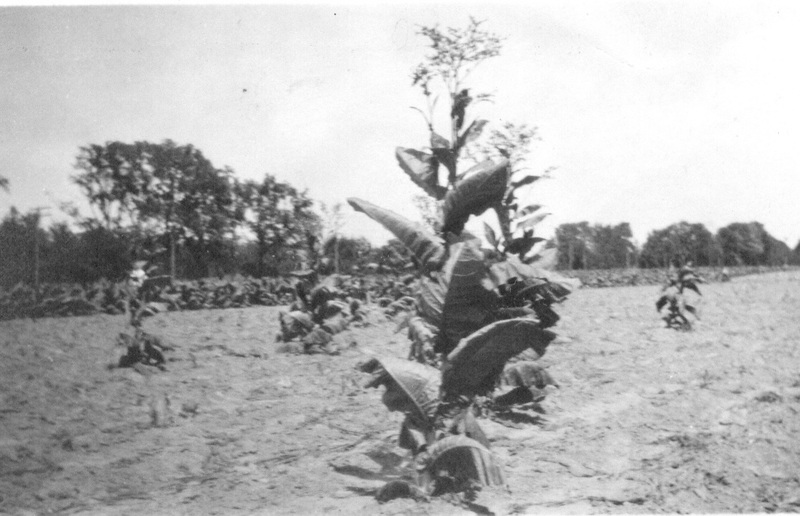 During the time that tobacco was being grown in Chemung County, when a farmer grew too old to farm, he would sell the farm, buy a little land and a house in the village and grow a few acres of tobacco as a cash crop. 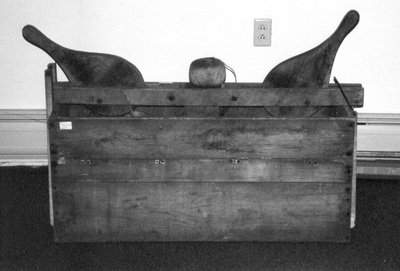 This served as a “Social Security” system.